Safety is undoubtedly the most common issue associated with motorcycle use among transport professionals and the public. over 50 times more likely to be seriously injured in a reported road collision (RRCGB – 2012). Positively, however, the number of motorcyclist fatalities (328) represents a decrease of 9% between 2011 and 2012 and is the lowest on record. 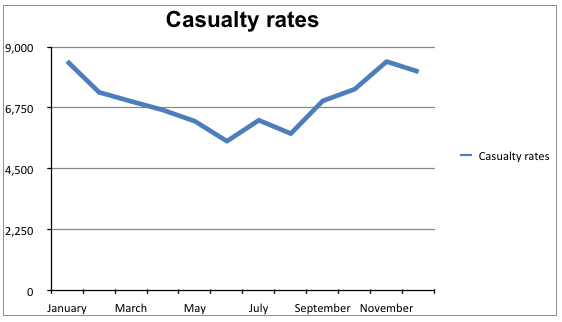 Further, the number of reported casualties (19,310) represents a 15% decrease on the 2005-9 average (RRCGB – 2012). That said, as a mode of transport, the frequency of motorcyclist deaths and casualties remain significantly disproportionate to use. Loss of control was recorded as the contributory factor in 16% of motorcycling collisions, making it the most common factor in 2012. Further, 78% of all motorcycle collisions involved another vehicle. What about dangers to pedestrians? In single vehicle collisions, 20% of motorcycle collisions involved a pedestrian. In comparison, 38% of cyclist collisions involved a pedestrian. It should be noted there are no disaggregated targets for motorcycles. A number of improvements in motorcycle design and rider training have taken place over the last decade and the overall long-term casualty rate for motorcycles has generally improved, despite the largely urban nature of motorcycle use and greater volume of larger vehicles within the same road space. 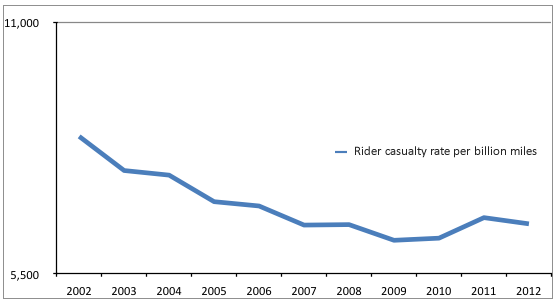 While there is no place for complacency in road safety, it is important to recognise that a key measure of safety, the rider casualty rate per billion miles (a proxy for rider exposure to risk,) showed a year-on-year improvement between 2002-2007. Although the rate has fluctuated since then, 2012 saw a 23% decrease in the casualty rate over a 10 year period and a 31% reduction in the fatality rate on the 2005-2009 average. 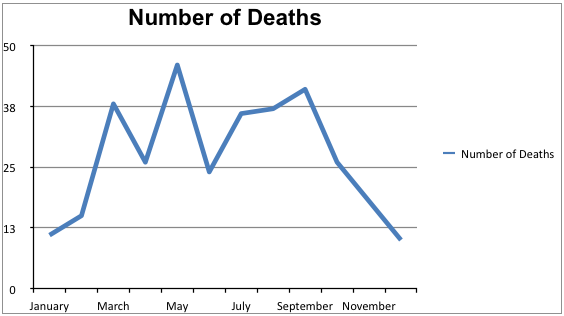 As positive as that sounds, in the same year, for every billion vehicle-miles driven on our roads, there were 6 deaths. However, this figure jumped to 112 deaths for motorcycle riders. A hugely disproportionate gulf in risk clearly remains. Although the Compendium of Motorcycling Statistics has not been updated since 2009, the DfT’s Reported Road Casualties, Great Britain Annual Report 2012 provides data on wide-ranging issues which highlight some important trends, characteristics and risks for motorcyclists. Urban and rural areas experience different patterns of motorcycle collisions. The severity of these collisions also varies depending on the hazards encountered and the speed of the vehicles involved. The fatality rate (per billion miles) on rural roads is approximately twice as high as that of on urban roads. Conversely, the ‘all severity’ collision rate on rural roads is just over half that of on urban roads (DfT 2013). Too often the focus for intervention will be on rural casualties. Clearly strategies need to be targeted in both rural and urban areas. In congested areas, motorcycling is a popular alternative to the car and rider vulnerability in towns and cities needs to be addressed with similar vigour to strategies in rural areas where motorcycle safety has a higher profile. 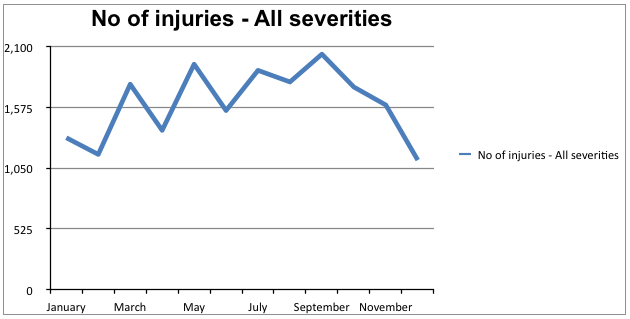 Generally speaking, in numbers terms there are more motorcyclist deaths and injuries during the spring and summer. However, as noted above, given the seasonal nature of motorcycling, there are considerably more riders on the roads at this time of year who can potentially get hurt. 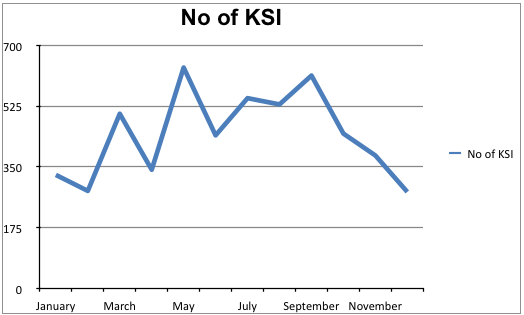 The motorcycling casualty rate shows that, per billion miles ridden, there are more casualties in the winter months – most notably due to the poor weather conditions. Many riders (eg commuters) travel all year round. It is important that if seasonal factors do influence policy that the full picture is understood. Sixty nine per cent of all motorcycles involved in collisions in 2012 were reported as “at a junction”. This means that junctions are the most common collision location and, according to studies, these are most likely to be precipitated by another road user. Many collisions take place at junctions where the driver of a motor vehicle may have “looked but did not see”. There are also a minority of riders who ride inappropriately and expose themselves to higher risk. 14% of motorcycle collisions involved overtaking a moving or stationary vehicle and 10% were reported as ‘going ahead’ on a bend.